The CPD, the Mayor’s Office (Richard M. Daley, at the time of the alleged crimes), as well as the U.S. Attorney for Northern Illinois, the FBI, the U.S. Department of Justice, the U.S. Attorney General, and the corporate media would like us to believe that what transpired with these seven officers is a cut and dried example of good cops gone bad. As it turns out, in 2011, a 26-year veteran of the CPD, Otha (“TC”) McCoy II, came forward with new evidence—a videotape of a staged robbery and FBI reports covering an informant’s statements regarding the perpetrators of that staged robbery, all of which were suppressed at the trial—which show clearly that: 1) the first incident in question was a staged robbery conducted by the CPD Deputy Superintendent of Internal Affairs, Michael W. Hoke; 2) the staged robbery did not involve any of the CPD Austin Seven officers in question; 3) the staged robbery was created initially for the purpose of framing McCoy and his CPD partner, Jerry Saffold, both of whom had already been cleared in an earlier investigation conducted by the CPD Internal Affairs Division (IAD); 4) that the officers of all agencies involved should be indicted for various crimes, including aiding and abetting the escape of a felon, obstruction of justice, witness tampering (soliciting false testimony), conspiracy to obstruct justice, malicious prosecution, violation of civil rights, conspiracy entrapment, fraudulent entrapment, and suppression of evidence; and, 5) all of investigations and staged events, legal or otherwise, by federal, state, and local officials dramatically increased the level of drug trafficking in the Austin District. Following the staged robbery and follow-up meetings—which, according to FBI 302 reports, included members of the FBI, the U.S. Attorney for the Northern District of Illinois and his assistants, and officers of the CPD who were now aware of the confidential informant’s initial report—this same group of officials continued staging entrapments and other events, including drug deals and searches, as well as pressuring the paid informant to change his story, as well as suppressing evidence of the staged robbery and sending the paid informant out-of-town, so that he would not be available for testifying during the trial. Thus, as it stands, virtually every aspect of the CPD’s investigation and subsequent actions is “fruit of the poisonous tree,” a legal term meaning that the case is voided because illegal actions were used to initiate the sequence of events and that these illegal actions tainted the entire investigation. All of this is sure to come up when the defense attorneys for the Austin Seven, including the three officers who remain in the penitentiary more than 20 years later, and for the citizens of the Austin District, whose civil rights continue to be violated—by the results of a series of deliberate acts on the part of the FBI, the U.S. Attorney for the Northern District of Illinois, and the Chicago Police Department—file a lawsuit in the near future. All of this begs the larger question: Who wanted to get these officers off the street? After all, McCoy and Saffold had been partners since 1988, when the 15th District was the #2 crime district in the city, according to most crime statistics. Working together, along with Albert Parks, Jr, and joined later by Leonard Perry, they closed down dealers and dope houses and returned stolen property, receiving multiple awards while making the district the #3 most livable district in the city in the process. Following the incarceration of the Austin Seven, which numerous community organizations protested, the Austin District was again overrun with drug trafficking and now leads the city in murders. Again, who exactly was interested in seeing these results? 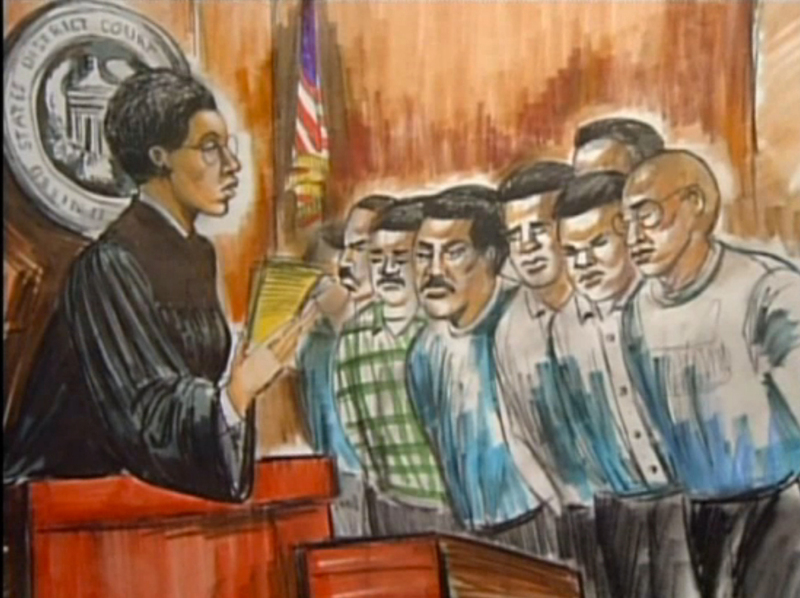 Based on TC McCoy’s 20-year investigation of the case, including interviews with those who were a part of the effort to incarcerate McCoy and Saffold, and later the Austin Seven, the known evidence points to an effort beginning with an order by Police Superintendent Matt Rodriguez to his Deputy Superintendent of Internal Affairs, Raymond Risley, in March 1993, to initiate an investigation into officers on the West Side in the Austin district. Given the later cooperation between the FBI, the US Attorney for the Northern District of Illinois, and the Chicago Police Department, it’s safe to assume that Rodriguez was following orders from somewhere in the mayor’s office. This investigation, the details of which were performed by Sergeant Eugene Shepherd, was illegal from the start because it violated the tenets of the CPD’s Policeman’s Bill of Rights, which require a filing of a complaint to begin an investigation; yet, not one valid complaint had been filed by anyone. In other words, there was no basis for initiating the investigation; hence, it was illegal. The premise for the investigation, an invention of the CPD, was that McCoy and Saffold were robbing street corner drug dealers of a $100 and $200, here and there. But given the tens of millions of dollars that were later spent on creating events that were designed to entrap the officers, it is obvious that something much larger was motivating the city, the CPD and its top officials, as well as the U.S. Attorney’s office for the Northern Illinois District and the FBI, not to mention the U.S. Justice Department, which refused to investigate despite having been shown the evidence of intent to get specific officers off the street. Given the amount of money involved in drug trafficking, ongoing operations require the collusion of a number of different players in order to keep the cash flowing. For example, in the award-winning investigative report, “Code of Silence,”1 we find that in “Operation Brass Tax,” a joint investigation by the FBI and the IAD of the Chicago Police Department—where two CPD Officers, Shannon Spaulding and Danny Echeverria, discovered that CPD Sergeant Ronald Watts was the kingpin behind a drug trafficking operation in the Chicago projects—the officers’ attempts to expose Watts’ crimes were initially blocked by the CPD and then by the FBI. So, when Risley’s investigators found no wrong doing on the part of McCoy and Saffold, Rodriguez ostensibly promoted Risley to Chief of Detectives and moved him out of the Internal Affairs Division, so that he (Rodriguez) could appoint Michael W. Hoke, as Deputy Superintendent of Internal Affairs, to pursue further investigations of McCoy and Saffold. Hoke has a long and sordid history with the CPD. He is a known racist involved in the torture of African-American citizens, in which he no doubt personally participated, who were forced to confess to crimes they did not commit, resulting in convictions that include two individual death row sentences. This revelation of Hoke’s involvement in torture occurred in 1973, when he was named as one of the perpetrators in the first publicly known use of electric shock as an instrument of torture.3 Hoke was also a CPD Internal Affairs commander when data on this and other incidents of police brutality were erased. Later, when the ringleader of the torture program, Jon Burge, was indicted in 2005, Hoke was granted immunity from prosecution by special prosecutor Judge Edward Egan and took the Fifth under questioning. This pattern of targeted, racist incarceration and torture from the CPD continues to the present, as we see in the July 19, 2006, 292-page report issued by special investigators Egan and Robert Boyle. Costing $7 million over four years, the investigation was intended to close the book on a 33-year period of unpunished violence by Burge and his cronies. Instead, it implicates everyone—from the then mayor, Richard M. Daley, and state’s attorney to every single CPD superintendent over the past 23 years—in a massive conspiracy to cover up the institutional nature of police torture, terrorism, and murder. Beyond the details of Hoke’s criminal behavior throughout his career, the larger question is the nature of the CPD’s culture of crime, including those among Hoke’s immediate and civilian supervisors who knew about his activities. During the Burge torture scandal, evidence showed that Richard M. Daley, while serving as Cook County state’s attorney from 1981 to 1989, ignored medical evidence related to Hoke’s use of torture. Most recently, a report by the Justice Department has confirmed that torture, as well as other forms of excessive force, are still a part of CPD culture.9 Nothing has changed. Investigative reports that bring confirmation of the department’s steady track record of criminal activities are part of a circular pattern, going back generations,10 in which ineffective reforms are instituted and then ignored and forgotten, until the next series of revelations raise the ire of citizens and draw another round of investigations and the lip service by authorities. Hoke’s initial investigation—like the one conducted under Risley, which was also without probable cause (that is, no complaints had been filed) and, therefore, was also illegal—turned up nothing on McCoy and Saffold. Following this, Hoke began his series of staged events: a robbery, a search, an entrapment, and fake drug deals. In an effort to restore justice to the seven police officers that were illegally investigated, kidnapped, and incarcerated, and to restore the civil rights of the Austin community—where these officers and their supervisors had severely curtailed drug trafficking and where their incarceration allowed high levels of drug trafficking to resume—let’s review the details of the various illegal actions of members of the Chicago Police Department (CPD), the US Attorney’s Office for Northern Illinois, and the FBI, who perpetrated the real crimes which were committed. According the CPD’s Policeman’s Bill of Rights, the initial investigation, and those that followed, were illegal as soon as they were initiated, since no complaints had been filed; in other words, there was no probable cause to initiate the investigation because there was no wrongdoing. This alone is cause for overturning the case, but there’s more, and it gets worse. 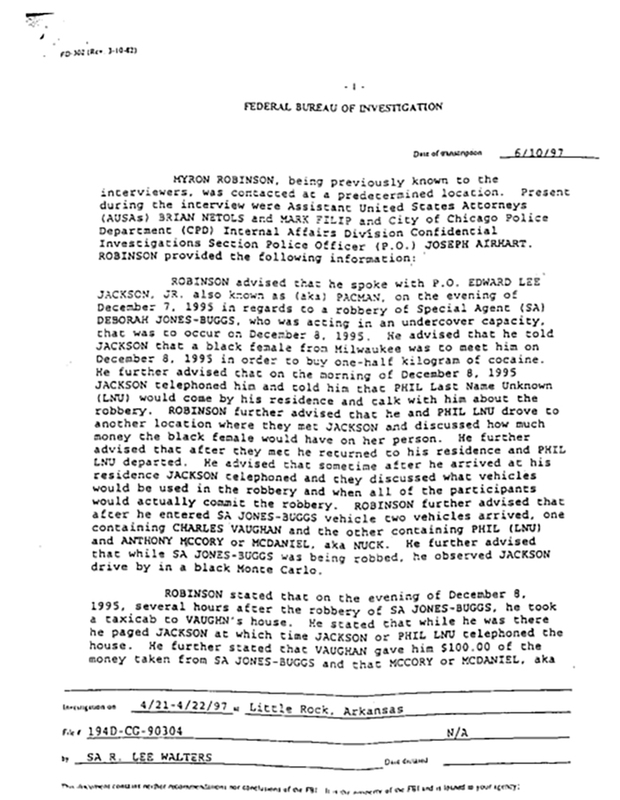 The so-called investigation also involved the use of a convicted felon under house arrest, who drove an undercover police IAD Corrupt Practices car to a staged robbery that used lookalike stand-ins in order to implicate officers, including officer TC McCoy, who were targets of the illegal investigation; according to FBI reports, the CPD, US Attorney, and the FBI ignored the report of their informant that Hoke was behind this crime; and further, the CPD, the US Attorney’s assistants, and the FBI asked the illegally kidnapped officers to lie about those present at the staged robbery and about other events. The staged robbery took place on December 8th, 1995.11 As we have detailed in our narrative of this event,12 those involved on behalf of the CPD included a number of officers, including one police agent posing as a drug dealer, a paid informant, a cousin of the paid informant (under house arrest fighting “use of an unlawful weapon by a felon” charge), and a felon (who subsequently committed a murder and was released to the streets, in return for his silence). One FBI agent—the woman to be robbed—and her partners (who were there to protect her) were also involved. About 13 months after the staged robbery, on January the 14th, 1997, Myron Robinson, the paid informant, who appeared on the film of the staged robbery, getting in a car, which was later identified as an FBI undercover car—was brought downtown to the US Attorney’s office. At that meeting was Jim Burns, the sitting US Attorney for the Northern District of Illinois. Also in the office was Mark Filip and Brian Netols, the Assistant US Attorneys who were prosecuting this case, as well as R. Lee Walters, FBI agent and Thaddeus Buggs, FBI agent, and Police Agent Joseph Airhart and Sergeant Stephen Jackson of the Chicago Police Department. 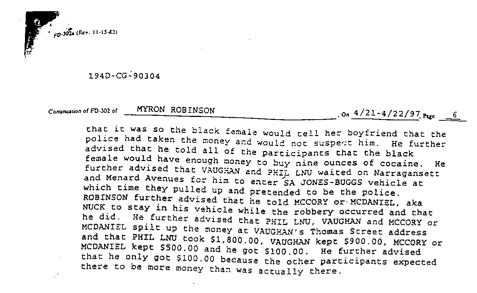 According to an FBI report, at that meeting, Myron Robinson described a series of events to everyone present which indicated that the staged robbery was entirely Hoke’s idea. Robinson further stated that Officer Edward Jackson, Jr. was not there. We emphasize that the U.S. Attorney and his assistants are sitting there, two agents of the FBI are sitting there, and two officers of the Chicago Police Department are sitting there when Robinson says all this. As such, all of those present are fully aware that the robbery was a hoax and that Hoke hoped it would be useful in implicating tactical unit officers who weren’t present at the staged robbery, despite false identification by Robinson. In other words, for example, Robinson would lie, as he did before the Grand Jury, to ensure that Jackson, whose look-a-like was present at the staged event, would be found guilty of robbery … even though he wasn’t there. We are quite sure that the required CPD paperwork associated with this concocted robbery will bear this out. 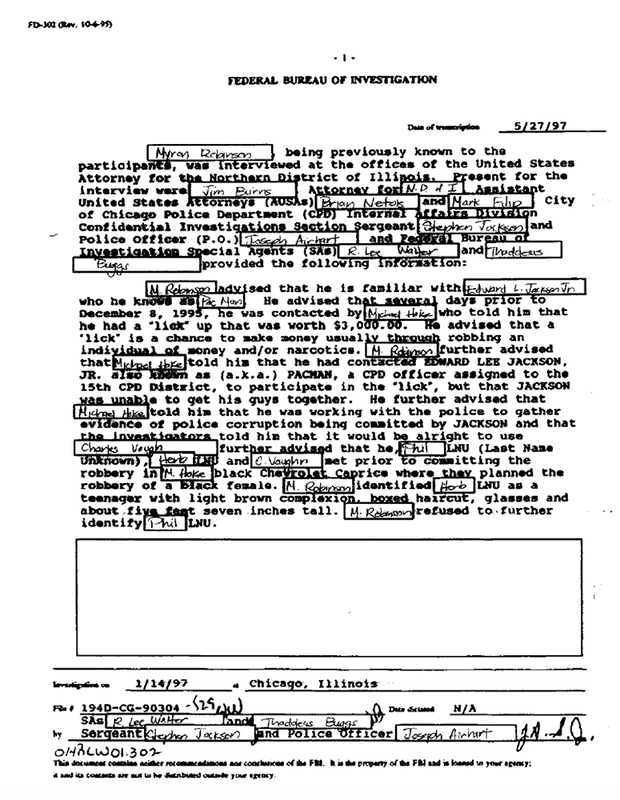 Everything that Robinson says is documented by the FBI (302) document, typed up by R. Lee Walters, with all of the officers’ signatures attesting, with the FBI’s redaction restored by TC McCoy. See below. Despite this awareness on the part of all those present, no actions were taken based on Robinson’s statements; in fact, the Austin Seven were prosecuted for other staged entrapments that followed this meeting. Further, according to another FBI 302 report, on April 21-22, 1997, FBI agent R. Lee Walters, Assistant U.S. Attorneys for the Northern Illinois District, Brian Netols and Mark Filip, and CPD Internal Affairs Division Confidential Investigations Section Police Officer, Joseph Airhart, travelled to Little Rock, Arkansas, where the confidential informant, Myron Robinson, was sequestered (and from where he was later made unavailable as a witness at the trial of the Austin Seven), to get Robinson to change his story. 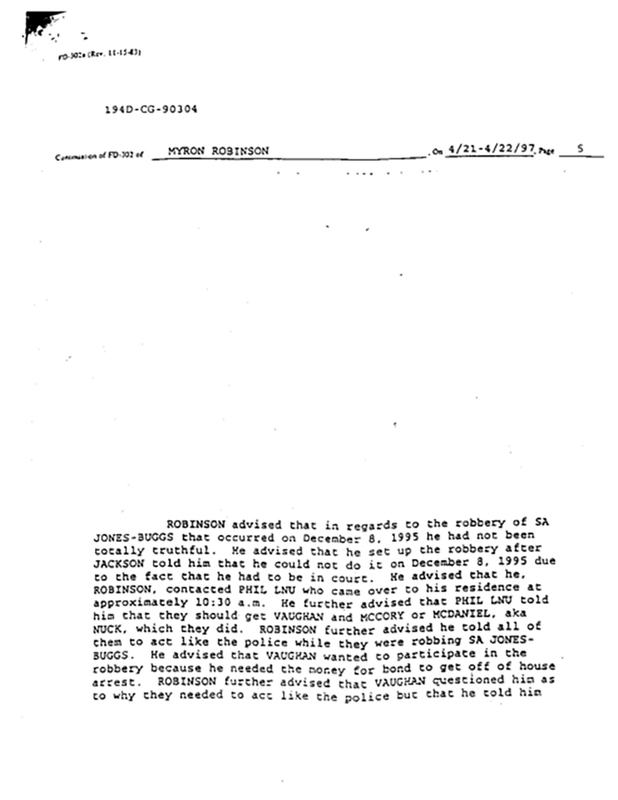 In that 302, a copy of which follows, Robinson advises that he wasn’t truthful in the first interview and disingenuously changes his story to place Jackson at the scene of the staged robbery. Having both 302s in hand, this lie becomes obvious. The upshot of this series of meetings with Robinson is that all of the officials present are guilty of various crimes, including aiding and abetting the escape of a felon, obstruction of justice, witness tampering (subornation of perjury), conspiracy to obstruct justice, malicious prosecution, violation of civil rights, conspiracy entrapment, and fraudulent entrapment. In addition to all of these crimes on the part of these officials and officers present, everything that took place before and after the staged robbery and this subsequent meeting is “fruit of the poisonous tree.” Hence, all of the convictions of the Austin Seven are invalid. The difficulty in bringing the Deputy Superintendent of Internal Affairs, Michael W. Hoke, and the Assistant U.S. 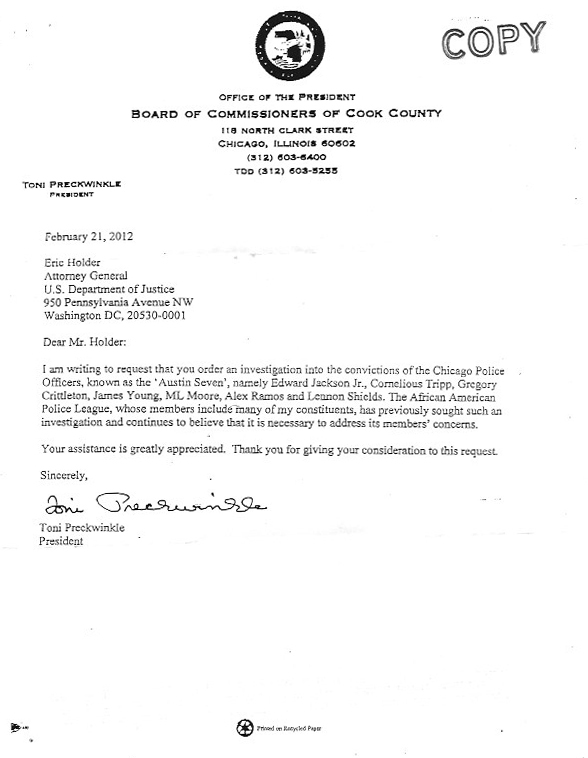 Attorneys, Brian Netols and Mark Filip, to justice is that those who could do so have shown support for the CPD’s, the U.S. Attorney’s, the Assistant U.S. Attorneys’, and the FBI’s illegal actions, as evidenced by the inaction of the U.S. Justice Department and the Mayor’s Office on Officer McCoy’s appeals based on the aforesaid evidence. “… paints the picture of a department flawed from top to bottom, although many of the problems it cites have, for decades, been the subject of complaints from citizens, lawsuits by attorneys and investigations by news organizations. Another example of federal, state, and local government agencies’ joint suppression of CPD criminal behavior, as previously noted, is “Operation Brass Tax,” where CPD Officers Spaulding and Echeverria’s attempts to expose these crimes were initially blocked by the CPD and then by the FBI. So, the notion that the CPD, or the FBI, or the Department of Justice are going to respond in earnest to the conspiracy of which they are a part is highly unlikely. “I worked with Officer McCoy for almost nine years, during that time I found him to be an excellent police officer. Over these years Officer McCoy was involved in the arrest of several thousand people. In all this time and activity, there was never once an allegation of McCoy taking money or doing anything illegal. Officer McCoy was well respected, not only by his fellow officers, and citizens, but also by the people he arrested. “For 18 years, Retired Police Officer McCoy conducted a personal investigation concerning the imprisonment of the Austin Seven. He has appeared on several talk radio shows and held a number of press conferences. During each of these public appearances, McCoy made allegations against members of the department involved in an alleged conspiracy to frame a number of officers. To our knowledge the Department has done nothing to investigate this specific allegation. Officer McCoy has also obtained a copy of a film which is supposed to represent a robbery of an FBI Agent. There were never any charges concerning this incident, McCoy actually names the people involved in this staged robbery, and made the information public. Perhaps it is time for common law grand juries, comprised of concerned citizens, to take up such investigations and indict those responsible for these crimes. Hopefully, such a process, if taken to its logical conclusion, would show why the Chicago Mayor’s Office and the Chicago Police Department, wittingly or unwittingly–with assistance from the U.S. Attorney’s office, the FBI, and the U.S. Department of Justice–wanted McCoy, Saffold, and the Austin 7 in prison. And further, we hope that such a process would show what entities and individuals have stakes in returning drug trafficking in the Austin District to its previously high levels, as current statistics indicate. 1 Jamie Kalven, “Code of Silence,” Invisible Institute and The Intercept, South Side Weekly, October 12, 2016. 8 Op. cit., “Black Leaders in Chicago Push for Investigation of Police Department,” The New York Times, November 26, 2015, page A23. This entry was posted on Tuesday, January 31st, 2017 at 11:58 am and is filed under Uncategorized. You can follow any responses to this entry through the RSS 2.0 feed. You can leave a response, or trackback from your own site.